If you were to look inside my mind, it would be categorized into various moods and vibes. I am always striving to create the perfect aesthetic, constantly tweaking my art, my clothes, and my Pinterest boards in order to better express myself. I think this is due in part to having synesthesia, which has me giving colors, moods and even genders to letters, numbers and words. It’s pretty cool, to be honest. Sometimes I’m feeling velvet red, listening to Lana Del Rey, watching Twin Peaks, dreaming of small cities by the sea, with angel wings, Hello Kitty bandaids and a Barbie Dream Dumpster. Other times I feel like minimal white and green, toting a Kanken bag, nursing 100+ plants in an Ikea furnished studio apartment in Tokyo. I have a number of moods like that floating around in my head at any given moment, and occasionally I’ll try translating them into fashion. This is where the moodboard comes in. 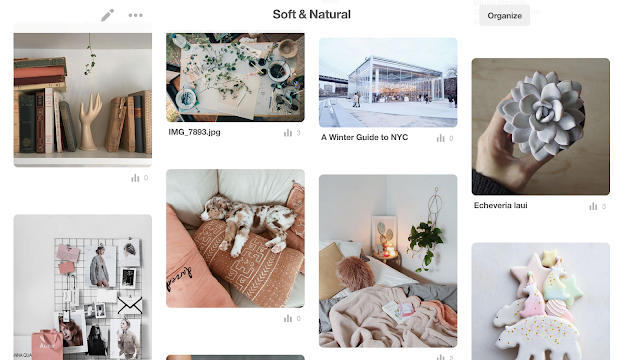 What better to give you those good vibes than a board full of handpicked inspiration? 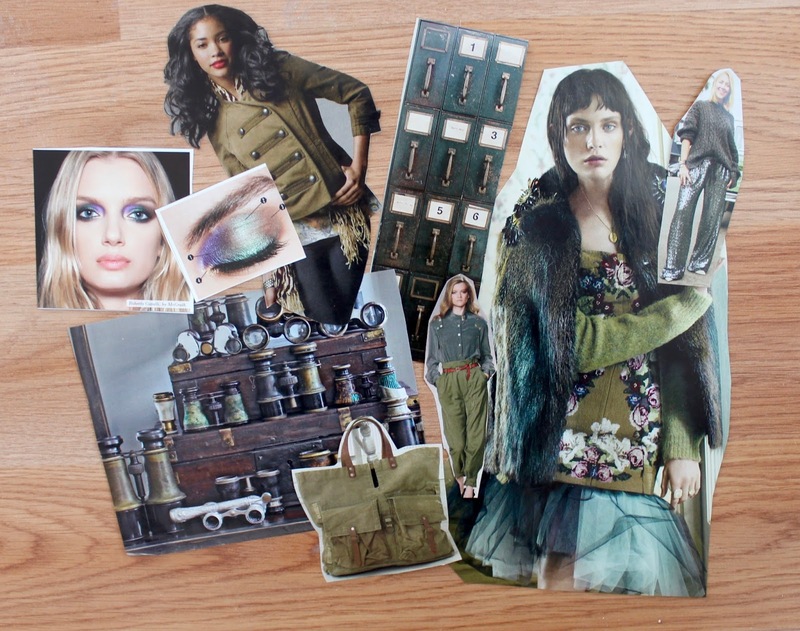 Today I’m going to show you how to make your very own fashion moodboard. Before even deciding the theme of your moodboard, you’re going to want to choose a medium. This is dependent solely on your personal preference. My top three places to create a moodboard are in a physical notebook, on Pinterest, and on Polyvore. 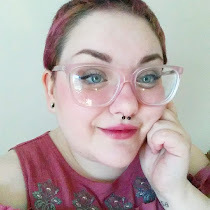 I’m going to run you through each of these ways, starting with the most fashion-based one, and a site I frequent nearly everyday- Polyvore. 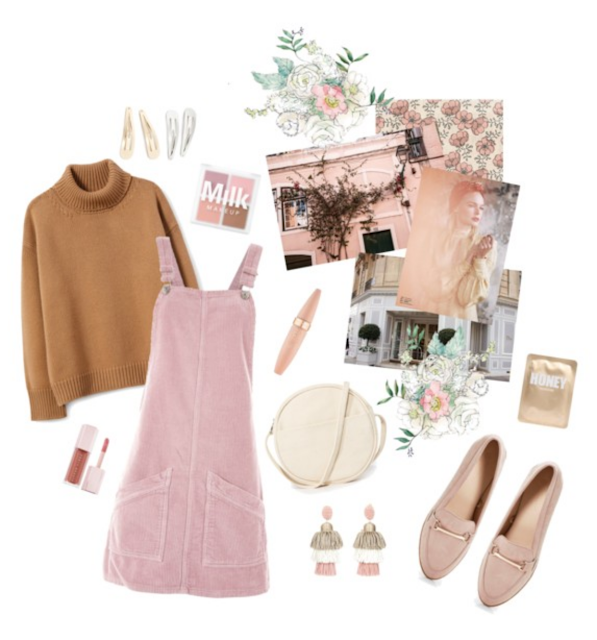 Polyvore is a site that lets you create ‘sets’ or collages of things like fashion, art or home decor, using their continuously growing database of items, which you can then go and purchase via links, if you so desire. My favorite way to use Polyvore is by creating my dream wardrobe. I’ll start out with a simple idea, and make a digital collage out of it, like the one below. These collages then show up on my page, which I can revisit again and again to get fashion inspiration. I recommend Polyvore for outfit moodboards, and for figuring out what styles you like. It has been a great tool for me in learning what my personal style is. It’s also a really relaxing activity. On nights when I can’t sleep, I’ll use the app on my phone to create some dream outfits. Next up is Pinterest, a site that most people know about, so I won’t go into too much detail. Being a longtime Tumblr user, I really love Pinterest’s boards, which you can use to collect photos and webpages into different categories. I have a board just for my style inspiration, but also a bunch of random moodboards whose contents form a cohesive and inspiring picture. I recommend Pinterest overall, as it’s a great place to save links. The good thing about Pinterest moodboards is that you can continuously add to them, and look back on them for inspiration. My favorite way of creating a moodboard, however, is on good ole’ notebook paper. I own a ridiculous amount of notebooks, so naturally a couple of them are devoted to fashion collages and moodboards. I have an up-cycled book that I paste in full magazine pages, which is my overall life inspiration book. Like a Pinterest board, the entire book is a moodboard. My other notebook is filling up with all things fashion related, from notes about fabrics to outfit inspiration. This is where I create most of my fashion moodboards. Once you’ve chosen a platform, it’s time to decide on a theme or mood for your board. For my example, I focused on color, but you can use anything you want. Color, style, or a specific piece of clothing are all great places to derive a theme from. 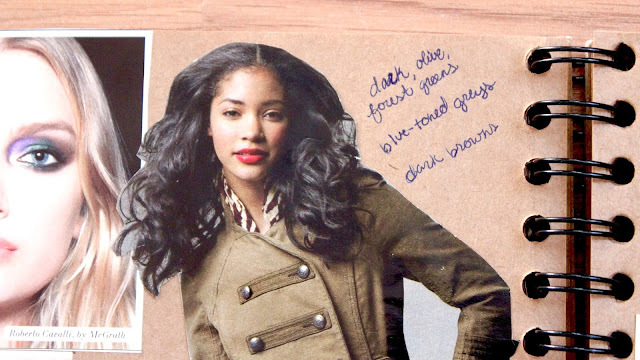 I went for a dark, faded color theme, with a hint of military and feminine style. Open a fresh notebook page, start a new Pinterest board, or create a new set on Polyvore. Now you’re ready to start creating your moodboard. It’s time to gather up your images and links. If you’re on Polyvore, you can save your favorite pieces in “my items” or search the database to create your set. Pinterest doesn’t really require any steps after collecting your images/links. Simply save them to your board and continue. For the notebook one, you’ll want to scour magazines or print pictures off the internet to collect for your collage. You’ll want to look not only for outfits and pieces of clothing, but also textures, colors and items that fit the mood of your board. I added a picture of metal drawers to my moodboard, which continued with the dull color and vintage feel of it. Some examples of things to add to your moodboard are: scrapbook papers, paint chips, clothing tags, newspaper clippings, photographs, and drawings. Putting things together is one of the more fun parts, in my opinion. On Polyvore you can resize, rotate and cut up images just like in real life. When working in a notebook, I like to keep the page balanced with a fair amount of pictures. I usually also leave some space so I can scribble in some notes or add bits of washi tape. Likewise, you can add neat effects on Polyvore. With your completed moodboard, you can flip back to it again and again to get outfit inspiration. 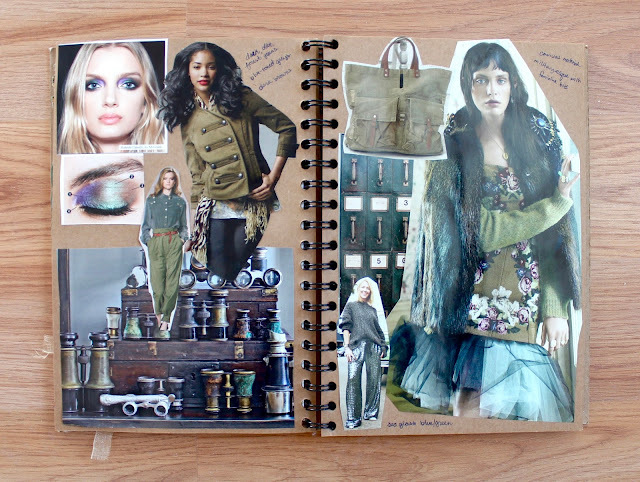 Making a moodboard around a specific piece can help you figure out how you want to style it. A board of solely one style of fashion can help you discover what you really love. I like to keep a certain vibe in mind when creating all of my moodboards. If I love the vibe, I’ll be inspired by it over and over. That's the basis of it! With these tips you can make your own moodboards to help inspire you to dress up, or help you find your personal style!